Hi guys Just got a 78 CJ5 which seems to have some electrical "quirks". The dash/instrument lights don't work. The break light and signal lights come on but none of the general instrument lights. I replaces the headlight switch but that wasn't it. The fuse panel I have has the old glass fuses and I can't find much info on it. Would it be worth finding a more modern replacement fuse panel? Just the fuse panel? If you are confident on rewiring then go for it but you really should think about completely redoing all the wiring. Just a new fuse box may not reduce the number of electrical issues you will have in the future. Also, start thinking about grounds. A lot of issues start with a bad ground and until you add some new grounds to different parts of the jeep, you will start seeing a lot of grounding problems. A bad ground to the dash will cause problems like you describe but you probably will have issues with your fuel gauge and temperature gauges. So if you are not having issues with your gauges, then it's probably not a ground issue. As for the dash lights, make sure you got the right year headlight switch. There were two types and the wrong one may of been in there to begin with. look to see if you have the jumper on the headlight switch or not. your year will need to have that little jumper on it to work. checked when I got home, It's the right switch. to be honest the wiring all just looks like spaghetti but not sure I want to tackle redoing all of it. (never messed with an electrical project before.) it might be easier to start from scratch though than keep chasing individual issues that have built up. I just had the wiring harness in the steering column replaced because of a melt down in the signal light wire. Next step would be to get a test light and see where you have power and where you do not have power. Some investigating in the nest of wires (and reading the wiring diagram enough to know what color wire to look for) revealed that the orange wire was simply unplugged between the switch and the wires. I plugged it back in and the dash lights come on but not exactly how they are supposed to. The Speedo cluster stays on no matter what (even with ignition off and keys out which is probably why it was unplugged.) the little rectangles only come on if the switch is completely in the dome light on position. You have definite electrical gremlins. I don't know how much money you are wanting to spend, but I am doing a painless harness in mine right now, and it has actually been very painless. Anyone could do it. I bought the direct fit one, but if you don't mind doing some splicing making up some connectors, then the 400 buck customization one would work fine. I have very little electrical experience so it seems worth the extra $400 to get the one that's all pre done. I went through the instruction manual and it seems pretty straight forward. I may just have fun as is all summer and then do that in the off season. If wires aren't fried or hacked up really bad and if you have the patience you can rebuid it for a fraction of the cost. There's YouTube videos that can show you how to soldier and heat shrink to make repairs. You seam to be able to read diagrams or wiring schematics. They usually read like a road map. If you're interested I can give you some tips to help with frustrations. Yes painless wiring is an option but if you're not adding circuits or your harness hasn't been in a fire. Just helped a guy the other day who was ready to buy one. I spent an hour or two at his house. Found a bad ignition switch. Repaired a half dozen bad but connections and he was good to go. I'm rebuilding mine soon and plan to document it in a thread here. Sometimes an old wiring harnesses may look to be a mess or hacked by the PO and actually may not. Lots of owners pull apart wiring harnesses trying to trace wires to their origins and generally never tape them back like they were. I just helped my friend and his newly purchased 65 Pontiac GTO that had some wiring issues behind the dash. The wiring was a rats nest from owners who added some gauges under the dash but after pulling it out and reorganizing it, we found only two wires were added into the original harness, which we removed, and the rest was original. We taped the harness back up like it was from the factory and figured out all the terminations points so everything works now like it should. Took a full day though. 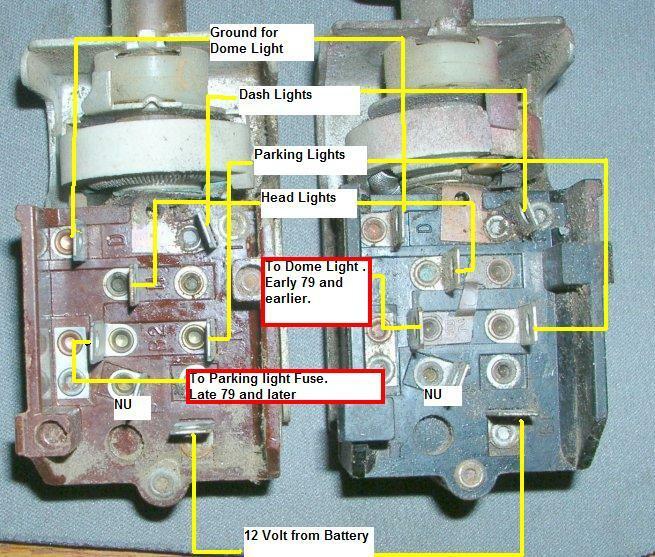 Its just a fact of life on these old Jeeps and cars alike, people who lack basic electrical skills have a tendency to rip wiring harnesses apart just to trace wires instead of using an electrical meter to do the work for them. Plus, back in the day, electrical prints weren't readily available to everyone like they are today on the internet. There are plenty of sources here on the forum to get you back up and running and guide you through the necessary steps that are needed to do so. On 'Black Betty' I swapped in a Ford PDB for underhood electrical for added devices. Not only did is centralize circuits neatly but once I got all of the soldering done my skills increased manyfold.